Last week was a bit of blessing in disguise in Los Angeles….kinda sorta. We got some much needed rain after months of drought. All the rain of course also created a lot of flooding and mud slides too. Today’s question is: what does one do during days such as these when one wants to make some Jujeh Kabob, Chicken Kabob? There is a simple answer to that question folks! 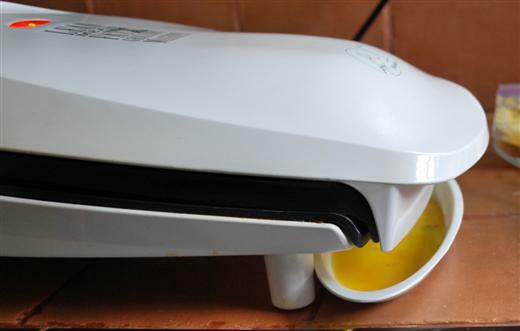 One takes out the George Foreman Grill! 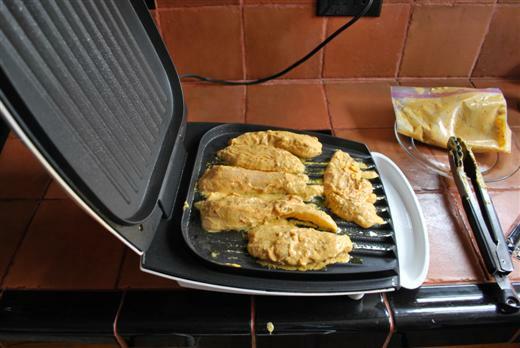 Have I ever told you how much I love my George Foreman Grill? I love it so much that I nicknamed it Georgie! Yes, indeed, that is exactly how it is referred to in our household. Georgie is the best and it’s one of the most used “toys” in our kitchen! Not only you can grill meat or chicken on it, but you can also make panini and grilled veggies too! OH YES! Anyway, the reason I am posting this method of grilling Chicken Kabob is because one of the readers Anahita brought up the subject. She left a comment asking how does one make Jujeh Kabob when one doesn’t have an outdoors grill. Personally, this is how I grill my kabobs indoors! If you don’t have a Georgie, then I strongly suggest you invest in one! 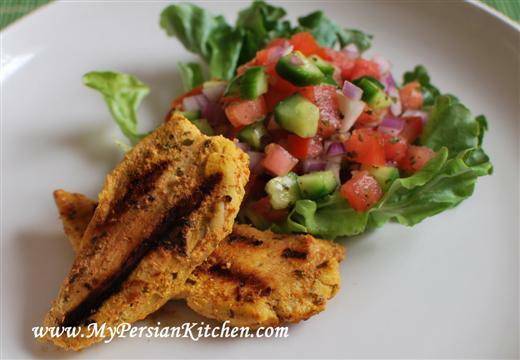 I have posted before about Jujeh Kabob on both how to marinade and grill. This is a great meal idea when you are limited on time. It’s pretty fast and delicious. 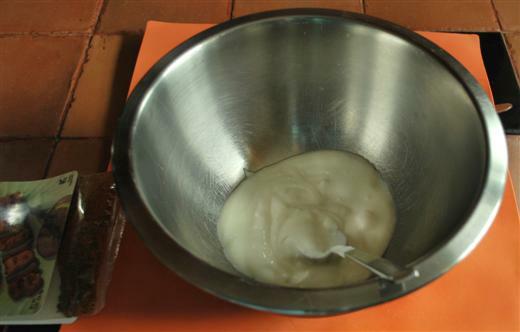 Place yogurt in a bowl. Add Chicken Kabob seasoning and mix well. 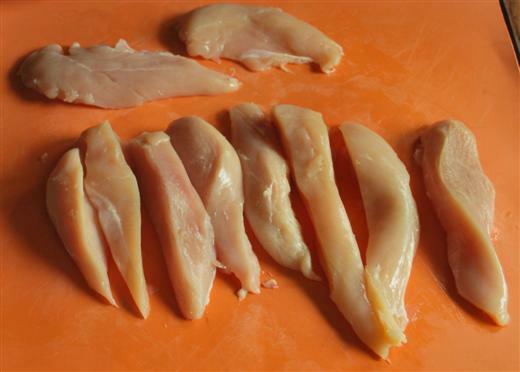 You can either leave your chicken breast whole or cut it into strips. I went with strips! Mix well until chicken is completely coated with yogurt and seasoning. Place in a bag and let rest either over night or at least one hour. 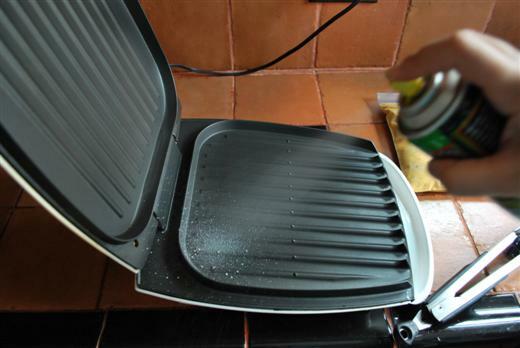 Warm up Georgie and spray all over the grill with olive oil spray. Place chicken strips on top without crowding them. Close the grill and cook until chicken is done. This is actually a fast process that takes less than 10 minutes. Make sure you flip the chicken half way through. Make sure that you place the tray under the grill for all the juices that will drop. Serve chicken with any rice dish of your liking or for a nice and light meal with a salad such as Salad Shirazi! Isn’t this awesome? You even get the grill marks with Georgie! 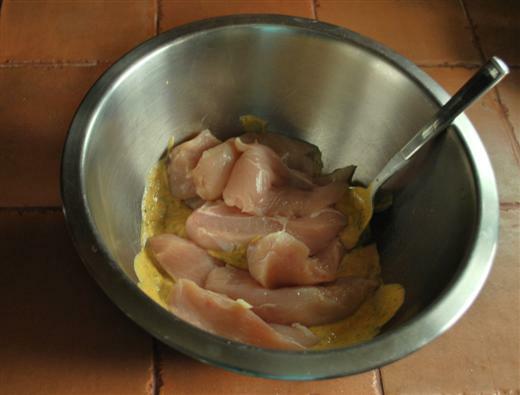 What is in chicken kebab marinade? 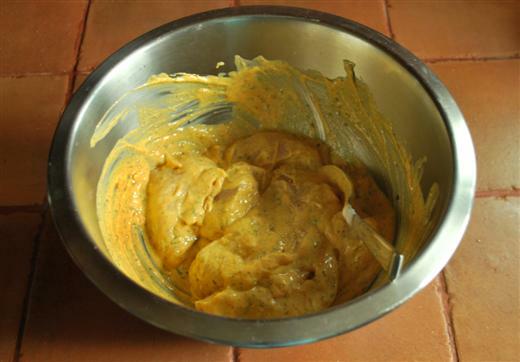 Steve, the main ingredients are saffron, salt, pepper, and lemon juice. The one that I used is a prepackaged type that I buy from the Persian store. I’m making these today since it’s a little rainy in Orange County. Just wanted to say thanks. Your recipes are a go-to lately! I don’t have a Foreman Grill so I’m going to bake them and then broil for a minutes at the end. I hope they come out okay. that’s a great idea to bake them. Alternatively, you could also simply broil them from beginning to the end! I made this the other night. Glad I did a test strip since I wasn’t sure what temp. to put the grill. I started at high for 10 minutes. The chicken was overdone. Finally set at a medium heat for 10 mins. Amazing!!! Lots of juices to pour over the meat after it was done. Wow, they look great and I am sure they are really delicious. I am from Germany and in my neighborhood, there is this persian restaurant TOOS in koeln, they make joojeh also with yogurt. It´s absolutely fantastic! Thanks for these nice pictures. Dieter, nice!! 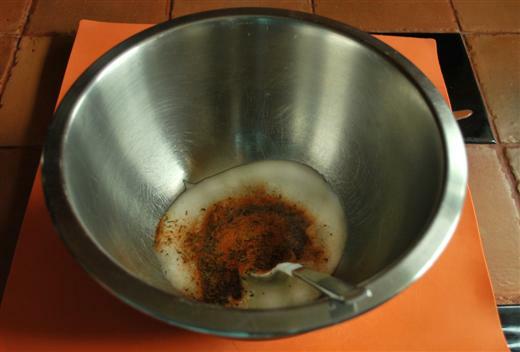 Now you can make your own Persian food! Hi I just wanted to say how much I love your website, I’m Irish and was first introduced to Persian food by my partner. I have tried out loads of your dishes and all have been amazing although I have to source a lot of the ingredients on-line as we have no such suppliers here. It’s a nice treat to cook for my partner especially to give him a taste of home! My family and friends are also converts they absolutely love the food – my house is now the place to be for Persian inspired feasts. Thanks!! Wonderful site. I cannot remember the last time I met someone else from Iran and have had very little aside from my memories to go on when it came to the food I grew up with. Very good recipes all the way around, thank you. That said, I have a couple of suggestions which may assist someone when it comes to indoor Kabob. Second thing is the use of chopped onions in the marinade. If you don’t have the time or inclination to chop the onions, use a food processor to make a sort of onion slurry (add a small amount of moisture as necessary during processing, usually lemon/lime juice or olive oil). Alternatively you can use a juicing machine to drop some peeled onion chunks into and just use the onion juice. 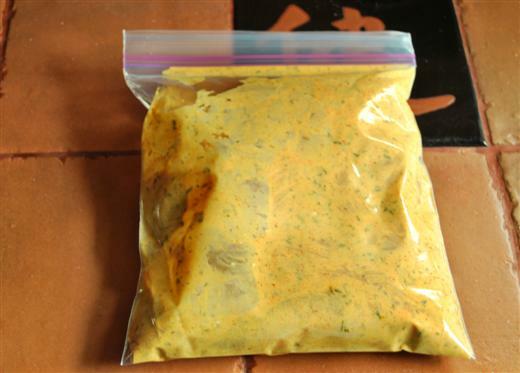 As long as you have the basic ingredients of any marinade present (acid and oil/fat) it will work just fine. The yoghurt sort of serves both functions so all you’re left to do is season! Eh? When using the Georgie, why flip the chicken half way through? The Georgie cooks on both sides, no need to flip. Soniyeh, I find that the chicken cooks more evenly when flipped.